Sen. Tom Cotton (R., Ark.) praised the White House for calling off its meeting with Kim Jong Un over North Korea's rogue nuclear program, saying President Donald Trump had seen through Kim's "fraud." Trump penned an open letter to Kim on Thursday canceling their June 12 meeting in Singapore, saying North Korea's recent belligerent rhetoric had forced his hand. Trump called it a "missed opportunity" and a "truly sad moment in history." 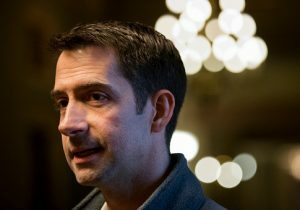 "North Korea has a long history of demanding concessions merely to negotiate," Cotton said in a statement. "While past administrations of both parties have fallen for this ruse, I commend the president for seeing through Kim Jong Un's fraud. As I have long said, our maximum-pressure campaign on North Korea must continue." Months of warming relations started with Trump's acceptance of an invitation to meet in March, but they rapidly deteriorated in recent weeks as North Korea signaled it was willing to pull out of the meeting. North Korea took exception to National Security Adviser John Bolton's reference to the "Libya model" of denuclearization which led to the collapse of the Gaddafi regime. Then, a high-ranking official said Vice President Mike Pence was a "political dummy" for suggesting that fate awaited North Korea if Kim didn't make a deal. The Trump administration wanted full denuclearization of North Korea, with the president promising security and prosperity through an agreement. "If we make a deal, I think Kim Jong Un is going to be very, very happy," Trump said last week. "I really believe he's going to be very happy."